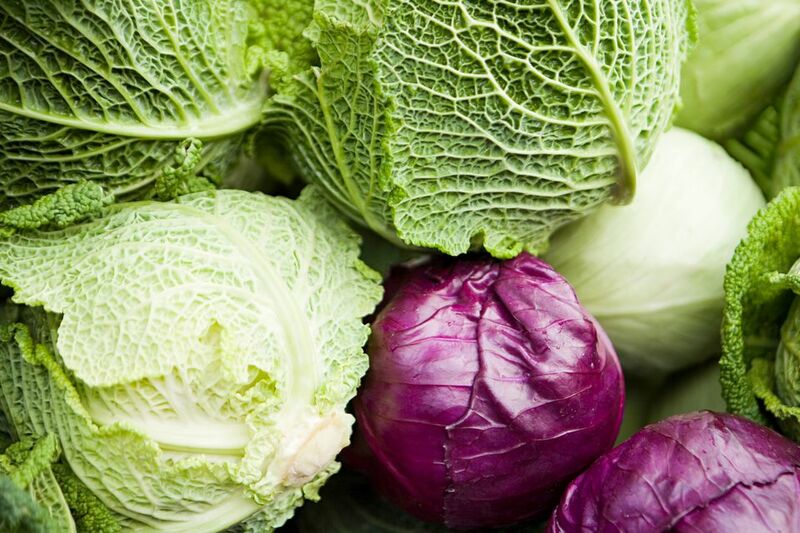 All varieties of cabbage are available year-round in most markets. They weigh in from one to seven pounds. Cabbage heads should be large and compact (not fluffy), heavy for their size, with tender green leaves showing no evidence of damage or insect nibbles. Fresh cabbage will have a generous amount of wrapper (outer) leaves. Greengrocers will pull off wilted outer leaves as the cabbage ages. Check the bottom of the cabbage to be sure the leaves are not beginning to separate from the stem, an indication of age. The Savoy cabbage variety will not feel as heavy as standard varieties, since the leaves are not as tightly furled. Store the whole head of cabbage in a plastic bag in the refrigerator for up to a week, two weeks if it is fresh from the garden. But remember, the older it gets, the stronger the flavor and odor will be. The looser-leaved Savoy variety should be used within a few days. Cabbage will lose freshness rapidly once the head is chopped, so plan on using it within a day. If you only need half a head, place the remaining half in a plastic bag and shake a few drops of water onto the cut side. Close the bag and refrigerate. The cut half should last another few days if it was fairly fresh when you cut it. To freeze cabbage: Cut into coarse shreds and blanch for 2 minutes in boiling water. Remove, drain, and chill. Pack into airtight containers and freeze up to one year. Once thawed, frozen cabbage will only work well in cooked applications. Canned sauerkraut should be used within six months. Fresh sauerkraut from the market should be used within one week. Cooked cabbage may be refrigerated in a covered container for up to four days. How Do You Select Cucumbers?